Electric light came to the farmers of Upshur County, Texas in July 1938. Citizens of the county and surrounding rural areas created the Upshur Rural Electric Cooperative Corporation (URECC) in 1937. They applied for a loan of $140,000 from the Rural Electrification Administration and built 28 miles of line to bring electricity to 139 members in that first illumination. By 1941, URECC served 2,100 rural members in nine counties. 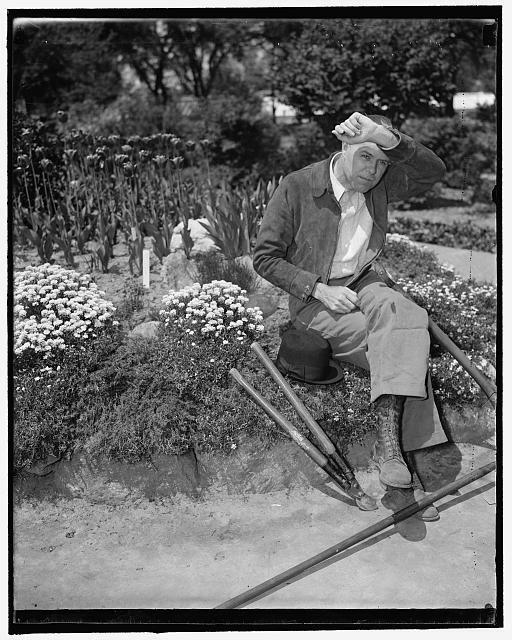 It borrowed money from the National Youth Administration (NYA), another New Deal program, and used NYA labor to build a new headquarters. It also made plans to build a new electric generating plant. The success of URECC and other rural electric cooperatives did not come without controversy. Privately-owned utilities did not like the competition from government subsidized cooperatives. URECC was a prominent player in some of the clashes with power company interests. Power companies opposed cooperatives building their own power generation facilities, wanting to confine their competition to power distribution. 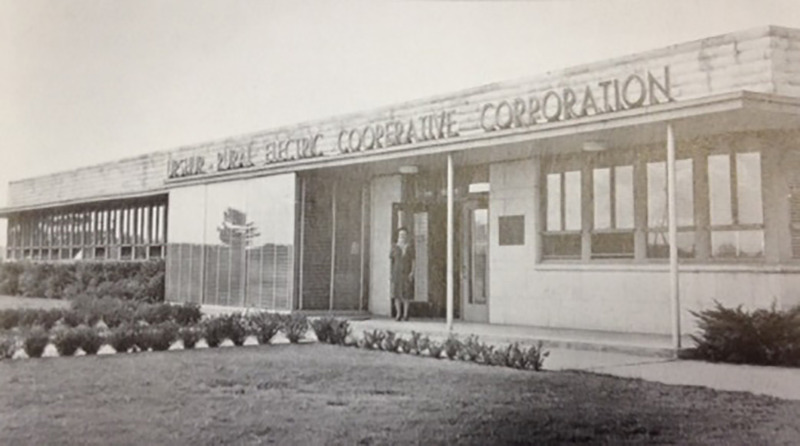 In 1941, URECC joined with other cooperatives to form the Farmers Electric Generating Cooperative, Inc., intending to build a $1 million generating plant. The generating cooperative hired contractors to string copper wire transmission lines from Gilmer to the participating cooperatives. By late 1941, the United States was gearing up for a war that was soon to come. Copper was in demand and subject to government restriction. Congressman Thomas Winter of Kansas, accused the REA of allowing the hoarding of copper near Gilmer and several other East Texas communities in violation of law and to the detriment of war defense preparations. 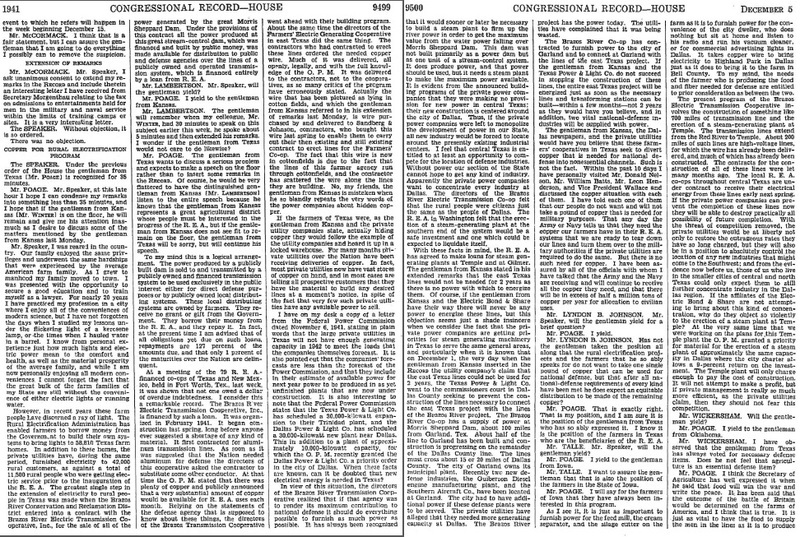 He accused the REA of “teeming with Communists.” Congressman Bob Poage of Waco, Texas defended the REA and the cooperatives the next day explaining that the copper had been ordered for use by proposed generating cooperatives before any restrictions existed. He accused Winters of advancing the power companies’ interests. Ultimately, the REA and cooperatives were cleared of any hoarding charge, but the attack was widely seen as an attempt by the power companies to discredit the REA and slow down the cooperative movement. As towns expanded into rural areas through annexation, the urban electric providers began to encounter rural electric cooperative customers. URECC sought the right to keep its members, who now were within city boundaries, and to offer services to other households within the annexed area. Southwestern Gas and Electric Company, who had the franchise right to provide electricity in the town of Gilmer, sued URECC to enjoin them from offering services in the expanded city limits. The case went to the Supreme Court of Texas which ruled that URECC could keep its existing members who were annexed into the city limits, but could not offer services to any other persons in the city. This ruling had a negative effect on cooperatives and they began to lose customer coverage in areas where municipalities expanded. A change in Texas law and later litigation allowed cooperatives to serve customers in the city. Despite challenges like these, URECC continued to grow. As of 2015, it served over 44,000 members. 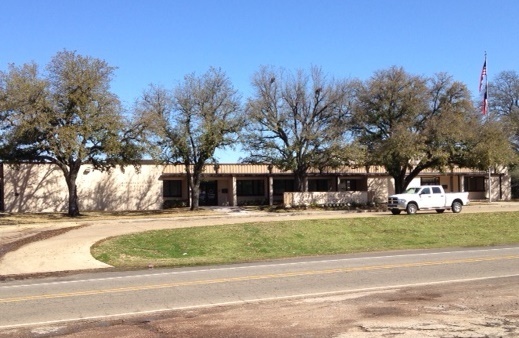 Upshur Rural Electric Cooperative Corporation Building: URECC contracted with the National Youth Administration (NYA) to construct its new building in 1941 at a cost of $75,000. The building was the first phase in a larger project that included an electricity generating plant and an NYA training facility. Not all of those facilities were built. The building included offices for URECC staff, a training kitchen and a large auditorium. URECC staff used the kitchen to demonstrate new electric appliances to members. ~ Source: Rural Electrification Administration. Description: Robert M. Hayes, “Electric Co-op Breaks Ground on Etex Unit,” Dallas Morning News, May 9, 1941. Headline from Dallas Morning News Article, December 2, 1941: This article reported in detail Congressman Thomas D. Winter's attack on the REA over copper supplies stored near Gilmer, Texas for use by URECC and other members of a generating cooperative. It reports Winter as saying, "I say to you that the Gilmer copper steal is merely an example of the chicanery and political connivance that would be exposed by an honest and thorough investigation of the Rural Electrification Administration." ~ Source: John E. King, “Copper Hidden in Texas Cited as Proof REA Hinders Defense” Dallas Morning News, December 2, 1941. My lights are off: Electricity came to rural areas before the telephone. When a customer experienced a power outage, the customer would send a postcard requesting service. When one was accustomed to living without electricity, being without it for a day or two was a minor issue. ~ Source: Upshur Rural Electric Cooperative Corporation. 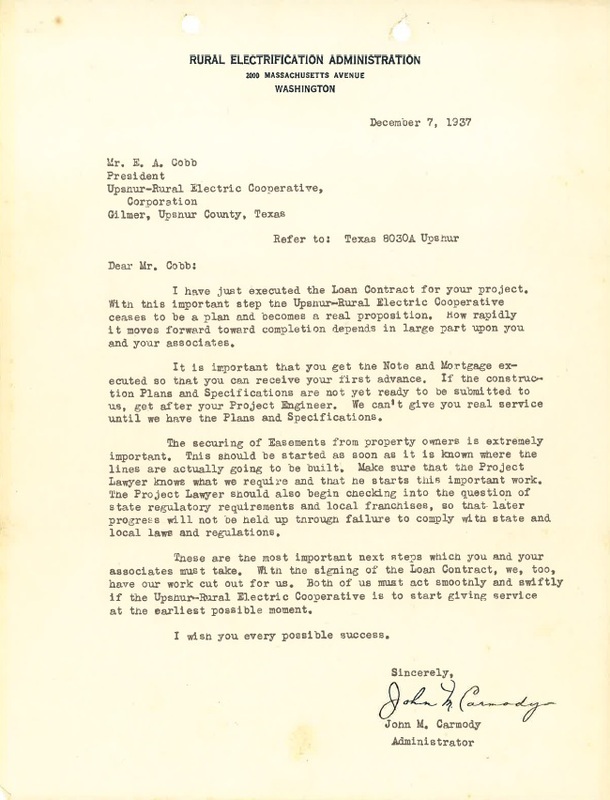 Paul E. Anderson, “Upshur Rural Electric Cooperative,” East Texas History, accessed April 21, 2019, https://easttexashistory.org/items/show/79. 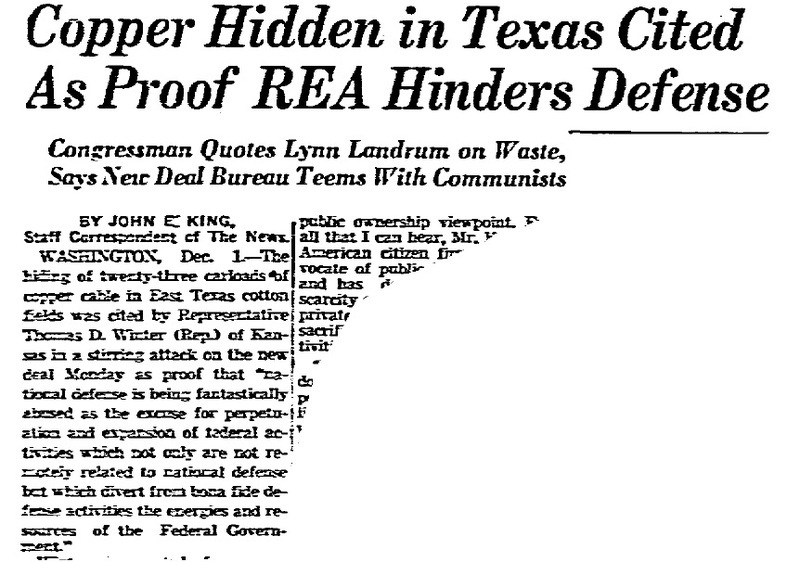 John E. King, “Copper Hidden in Texas Cited as Proof REA Hinders Defense” Dallas Morning News, December 2, 1941. Neal Johnson, Foundation for the Future:Wood County Electric Cooperative in the Twentieth Century (Austin,Texas: Texas Electric Cooperatives, Inc., 2000), 99, 128.